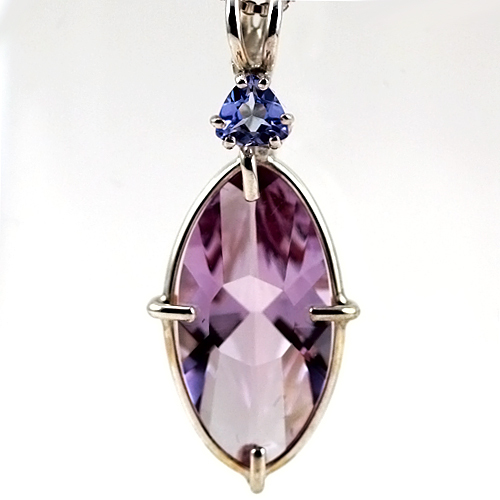 Dimensions (HxWxD): 1.25" x 0.5" x 0.25"
This beautiful Rose de France Amethyst Infinite Eye Pendant is a sparkling, highly faceted water-clear violet hue. And as with most Rose de France Amethyst, it has a very high frequency energy, manifesting all of the metaphysical qualities of Amethyst with the added benefit of such a high & finely tuned energy signature. This amazing new pendant, cut according to principles of sacred geometry, resembles the legendary Eye of Shiva. Created to gently encourage our inner vision, this piece of gemstone quality amethyst carries a high-frequency violet flame energy! It is set into a simple sterling silver setting which allows the stones to breathe and comes with a sterling silver chain which will sit upon the thymus, between the heart & throat chakras, where it will be of the utmost benefit. The Infinite Eye "celebrates the geometry of 'As above, so below'. This cut helps to place the center of infinity within our hearts and minds. The infinite flow of 'All that Is', centered in Love, becomes our daily companion. Consciously using this tool for maintaining your personal connection with your Higher Self (the Holy Spirit) will assist you in 'seeing' your way to compassion and forgiveness, accelerating Spiritual Growth." This Rose de France Amethyst will assist you in connecting with Higher Worlds. Amethyst energizes the crown chakra, which is associated with the color violet in the Western chakra system. And in combination with Tanzanite, this lovely gemstone necklace is sure to bring you in connection with the Divine. Because tanzanite is blue-violet it will assist you in issues around the throat, third eye & crown chakras, so this pendant can help you to access the Divine & speak in Truth which is in harmony with your individual soul and truth, your jiva atma & satya. Tanzanite is a rare blue-violet variety of the metamorphic mineral zoisite, hard and heavy with a vitreous luster. Tanzanite is a rare mineral discovered in 1967, and is only found in the Merelani hills area of Tanzania. Located in the Simanjiro district, the Merelani mining area is 16 kilometers south of the Kilimanjaro International Airport, and 70km south-east of the town of Arusha, at the base of Mt. Kilimanjaro. The limited supply makes Tanzanite 1,000 times more rare than diamonds. Tanzanite is a stone of magic, activating the crown and throat chakras, associated with the colors violet and blue in the Western chakra system, and is said by crystal healers to assist the bearer in developing clairvoyant and clairaudient abilities. Tanzanite is said to strengthen the will forces and thus assists in manifestation, strengthening our connection with spiritual guidance and balancing energy within the auric system and the physical body.